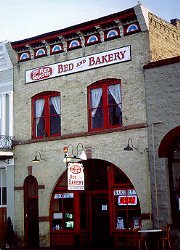 The Red Garter Bed and Bakery proudly offers lodging, a small town bakery and a gift shop in a restored two-story Victorian Romanesque building constructed in 1897 as a saloon and bordello. 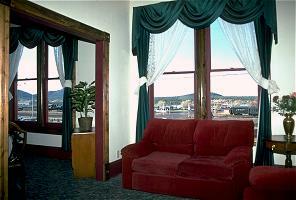 All guest rooms feature private baths, color cable TV and a fresh baked Continental-plus breakfast. Overlooking the depot for the vintage Grand Canyon Railway and the surrounding ponderosa pine forest, the "Honeymoon Suite" ($105.00) offers a bedroom with queen bed and an adjoining sitting room. The interior rooms with original skylights, are the "Madam's Room" ($85.00) a large room with a queen bed and the smaller "Parlor" ($65.00) with a double bed. Prices are for double occupancy, 10% discount for three or more consecutive nights. Plan on spending two days to fully see and enjoy The Red Garter, Williams' historic district, Sedona, the ghost town Jerome and the Grand Canyon area, all within an hour's drive.